Meagan Best Repeats as Ladies Squash Champion. Shawn Simpson Claims Record Ninth Men’s Title – Barbados Olympic Association Inc. 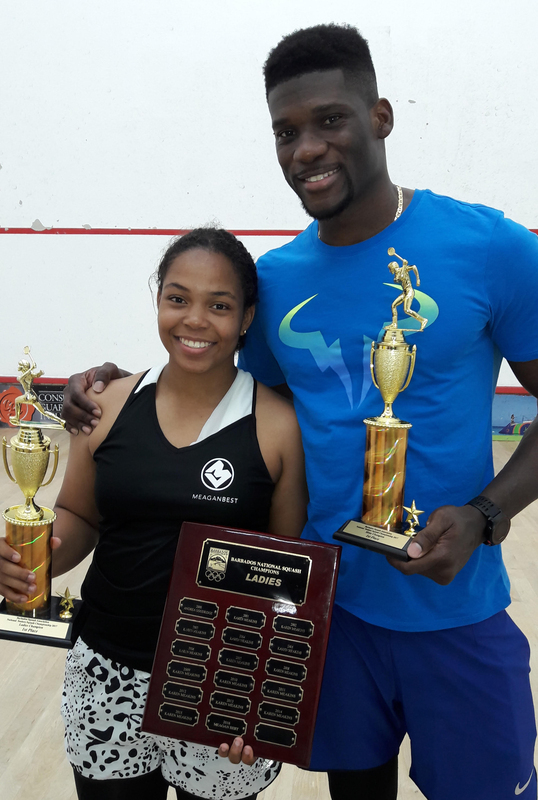 The climax of the 43rd annual BOA Barbados Senior National Squash Championships yesterday at the Barbados Squash Club (BSC) had the same two players from last year in both the ladies and the men’s finals and once again Meagan Best and Shawn Simpson repeated as champions with victories over Amanda Haywood and Rhett Cumberbatch respectively. In the ladies final Meagan Best overpowered the diminutive Amanda Haywood with a stunning display of attacking squash, utilising all the weapons in her burgeoning arsenal. Best had a fantastically successful 2016 and picked up where she left off in this ladies final where she deployed powerful drives, both straight and cross-court, on both sides of the court, and volleyed whenever possible and used her attacking boasts to never allow her opponent to settle. After dropping the first two games Haywood tried to mount a comeback in the third game which was the most competitive but her efforts were eventually undermined by her unforced errors when she was in a winning position in several rallies. In the end Best won in straight games 11-4, 11-6, 11-8 in 25 minutes to claim her second successive ladies senior national title in impressive fashion. The men’s final between the top seed, Shawn Simpson, and the #2 seed, Rhett Cumberbatch was more competitive and just as compelling. The tall, left handed Simpson was making his record 14th men’s final since his first appearance in 2003. The first two games were shared and were full of long rallies, with powerful hitting and cross courts drives as each player tried to move the ball to their opponent’s backhand side. Simpson won the first game for the loss of five points and the right handed Cumberbatch, the popular national junior coach, took the second at 7 to square things up at one game all after 20 minutes. Then the match took a bizarre turn. At 2-1 up in the third game Simpson pulled up with a serious looking ankle injury and had to take a 3 minute injury time-out. After resuming the match Simpson was visibly limping and wincing both during and between rallies. His game plan from then on was to simply keep the ball in play and make Cumberbatch play out each rally. In response Cumberbatch just seemed too eager to win every rally and kept going for ill advised shots trying to finish his opponent off. But he just kept hitting the tin. As his opponent’s error count increased, Simpson seemed even more determined to play through the pain and won the third game 11-5. Amazingly, the expected Cumberbatch surge in the fourth game never materialised. Simpson played it safe as far as possible, only going for the occasional winner, and Cumberbatch time and again clipped the top of the tin going for winning drops and boasts that just would not work for him. Simpson never trailed in this fourth and final game and duly claimed his record 9th men’s title 11-5, 7-11, 11-5, 11-5 in 46 minutes to move into first place on the men’s all time title list, ahead of local legends Rudy Goodridge and Mark Sealy who have each won eight national squash titles. At the trophy presentation ceremony afterwards the BOA Secretary General, Erskine Simmons, complemented the players and the BSA and congratulated all the winners while promising further financial support for squash in the year ahead. 1st – Leon Truss; 2nd – Craig Archer; 3rd – Edward Ince; 4th – Marcel Murrell. 1st – Mark Sealy; 2nd – Deepu Panjwani; 3rd – Preston Parris; 4th – Julian Greig.